It is often quite difficult to adequately assess the severity of a shoulder injury and the structures damaged following sports injuries, as simple muscle strains look very similar to more serious injuries. Thus early assessment from a skilled Shoulder Therapist or Surgeon is essential for early appropriate management. This may involve x-rays, and a special scan. Over 50% of dislocations can recur, especially in young sports people. Repeated dislocations lead to more instability and stretching of the shoulder joint, leading to long periods off sports and poor performance. We therefore recommend early surgical fixation. Keyhole repair offers the advantages of less pain, less complications and an earlier return to sports. Sprained joints tend to cause more long-term pain than true dislocated joints. Injections and physiotherapy often improve the pain, but surgical removal of the joint is often required for persisting pain. This operation can be done by keyhole (arthroscopic) surgery, which has the advantages of less post-op pain and an early return to sport. Traditional open surgery can also weaken the shoulder, by dividing important ligaments. This is avoided with arthroscopic ACJ excision. Subacromial Impingement (also known as Bursitis, Impingement Syndrome, Rotator Cuff Tendinitis, Supraspinatus tendonitis) occurs with repeated use of your arm overhead and in older athletes who develop small bony spurs which trap the rotator cuff tendons above the main shoulder joint. Injections and physiotherapy often improve this condition, but repeated steroid injections should be avoided (especially in athletes). Surgery involves keyhole 'cleaning' of the subacromial bursa with removal of the bony spur. This is called arthroscopic Subacromial Decompression. The rotator cuff is a very important group of tendons that provide movement and stability for your shoulder. Therefore when it is damaged pain and weakness can be significant. Tears caused by injury, especially in athletes, benefit from early repair because the tears can get bigger and more difficult to repair later on. Rotator cuff repair can be done by keyhole surgery or open surgery. We repair most tears by keyhole surgery with the same success rate as for open surgery. Superior Labral Antero-Posterior (SLAP) tears of the shoulder are more common in overhead throwing, heavy lifting and tackling sports. The biceps insertion in the shoulder is forcibly peeled or pulled off its bone attachment by a large pulling or peeling force. This can occur during a heavy lift, hard throw, tackle or fall. The symptoms are pain deep inside the shoulder with lifting and sports. Some people complain of a clicking sensation and pain extending down the upper arm. It is often difficult to diagnose without actually looking inside the shoulder with an arthroscope (keyhole surgery), which is the recommended treatment for this. The weak points of the biceps muscle is where the tendon attaches to the bone at the elbow and the junction between the biceps muscle and it's tendon. The biceps usually ruptures at the elbow in athletes. You will usually feel a pop and notice a lump in the front of your arm. In athletes and manual workers prompt early repair is advisable, as it can be very difficult to repair these later. The biceps may also rupture at the shoulder - this is usually in older people and associate with rotator cuff tears - if surgery is needed the tendon is attached to the humerus (this is called a tenodesis). The labrum is a cushion surrounding the socket of the shoulder joint (similar to the meniscus of the knee). Likewise, it can tear like the knee meniscus with injuries of the shoulder. Labral tears usually follow falls or direct blows to the shoulder, but may also occur with throwing or pulling injuries. They can be diagnosed with MR Arthrograms (MR scan with special dye injected into the shoulder joint), and confirmed at keyhole surgery (arthroscopy). Large tears are associated with shoulder dislocations and called Bankart tears. Swimming involves repetitive overhead activity, with particular muscular imbalances occurring around the shoulder complex to accommodate this. Thus swimmers are prone to shoulder pain, with over two thirds of elite swimmers suffering this at some stage. Treatment usually involves addressing the muscular imbalance by an experienced shoulder therapist. Arthroscopic surgery may be required for subacromial impingement and shoulder instability. Fractures around the shoulder have always been difficult to treat operatively, thus the results of shoulder fractures have not been as good as other fractures. With new fixation devices and safer surgical techniques we are able to fix difficult fractures early and allow early return to sports better than in the past. True frozen shoulder (a very stiff painful shoulder with no obvious cause) is very rare in athletes. However, a stiff painful shoulder following an injury (sometimes, quite minor) is not rare. In these cases it is essential to treat the stiffness early and then also treat the underlying injury that caused the stiffness. 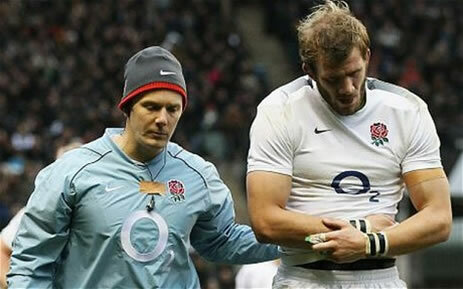 The joint teamwork of an experienced physiotherapist and shoulder surgeon is very useful for an early recovery. Arthritis is when a joint wears with age or overuse. The lubricant is reduced and the joint becomes stiff and painful. Keeping the shoulder active and the muscles toned is of benefit, along with painkillers. However, when the pain is severe enough to affect daily life and sleep a joint replacement is of benefit. 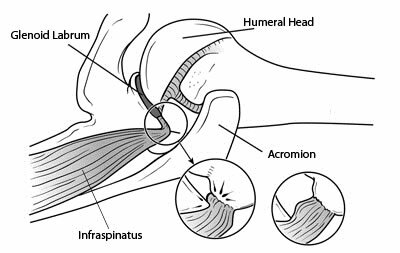 When athletes throw repeatedly at high speed, significant stresses are placed on the anatomical structures that keep the humeral head centred in the glenoid socket. When one structure — such as the ligament system — becomes weakened due to repetitive stresses, other structures must handle the overload. As a result, a wide range of shoulder injuries can occur in the throwing athlete. SLAP Tears (Superior Labrum Anterior to Posterior): In a SLAP injury, the top (superior) part of the labrum is injured. This top area is also where the long head of the biceps tendon attaches to the labrum. A SLAP tear occurs both in front (anterior) and in back (posterior) of this attachment point.Typical symptoms are a catching or locking sensation, and pain with certain shoulder movements. Pain deep within the shoulder or with certain arm positions is also common. (Left) The labrum helps to deepen the shoulder socket. 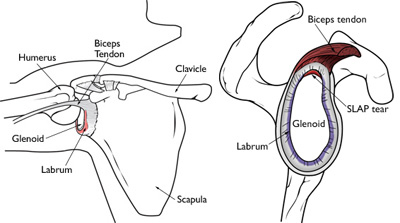 (Right) This cross-section view of the shoulder socket shows a typical SLAP tear. Biceps Tendinitis and Tendon Tears: Repetitive throwing can inflame and irritate the upper biceps tendon. This is called biceps tendinitis. 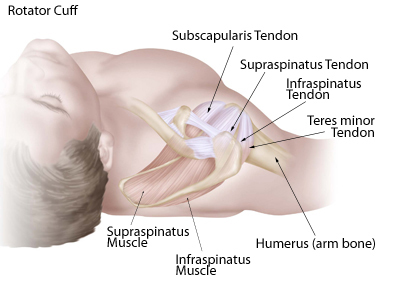 Pain in the front of the shoulder and weakness are common symptoms of biceps tendinitis. Occasionally, the damage to the tendon caused by tendinitis can result in a tear. A torn biceps tendon may cause a sudden, sharp pain in the upper arm. Some people will hear a popping or snapping noise when the tendon tears. (Left) The biceps tendon helps to keep the head of the humerus centred in the glenoid socket. (Right) Tendinitis causes the tendon to become red and swollen. Rotator Cuff Tendinitis and Tears: When a muscle or tendon is overworked, it can become inflamed. The rotator cuff is frequently irritated in throwers, resulting in tendinitis. Early symptoms include pain that radiates from the front of the shoulder to the side of the arm. Pain may be present during throwing, other activities, and at rest. As the problem progresses, pain may occur at night, and the athlete may experience a loss of strength and motion. Rotator cuff tears often begin by fraying. As the damage worsens, the tendon can tear. When one or more of the rotator cuff tendons is torn, the tendon no longer fully attaches to the head of the humerus. Most tears in throwing athletes occur in the supraspinatus tendon. Rotator cuff tendon tears in throwers most often occur within the tendon. In some cases, the tendon can tear where it attaches to the humerus. Problems with the rotator cuff often lead to shoulder bursitis. There is a lubricating sac called a bursa between the rotator cuff and the bone on top of your shoulder (acromion). The bursa allows the rotator cuff tendons to glide freely when you move your arm. 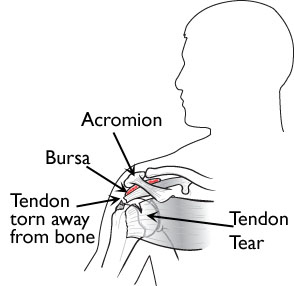 When the rotator cuff tendons are injured or damaged, this bursa can also become inflamed and painful. Internal Impingement: During the cocking phase of an overhand throw, the rotator cuff tendons at the back of the shoulder can get pinched between the humeral head and the glenoid. This is called internal impingement and may result in a partial tearing of the rotator cuff tendon. Internal impingement may also damage the labrum, causing part of it to peel off from the glenoid. Internal impingement may be due to some looseness in the structures at the front of the joint, as well as tightness in the back of the shoulder. 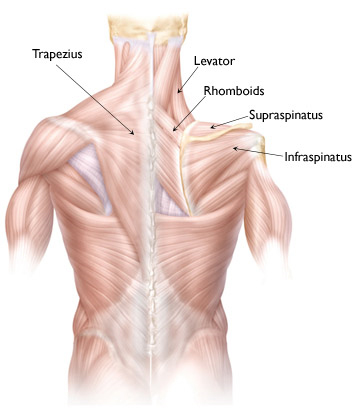 The muscles and tendons of the rotator cuff. Glenohumeral Internal Rotation Deficit (GIRD): As mentioned above, the extreme external rotation required to throw at high speeds typically causes the ligaments at the front of the shoulder to stretch and loosen. A natural and common result is that the soft tissues in the back of the shoulder tighten, leading to loss of internal rotation.This loss of internal rotation puts throwers at greater risk for labral and rotator cuff tears. Scapular Rotation Dysfunction (SICK Scapula): Proper movement and rotation of the scapula over the chest wall is important during the throwing motion. The scapula (shoulder blade) connects to only one other bone: the clavicle. As a result, the scapula relies on several muscles in the upper back to keep it in position to support healthy shoulder movement. During throwing, repetitive use of scapular muscles creates changes in the muscles that affect the position of the scapula and increase the risk of shoulder injury. Scapular rotation dysfunction is characterized by drooping of the affected shoulder. The most common symptom is pain at the front of the shoulder, near the collarbone. In many throwing athletes with SICK scapula, the chest muscles tighten in response to changes in the upper back muscles. Lifting weights and chest strengthening exercises can aggravate this condition. Sports-specific technique: poor performance and shoulder pain commonly originate in bad habits of technique. Often they are only clearly seen when muscle fatigue sets in. The variety of overhead movements required for each sport gives rise to very subtle and unique technique faults. These will depend on the type of sport and shoulder dominance. Flexibility: flexibility varies for the different muscles around the shoulder. For the major power muscles, it is important that flexibility allows freedom of movement for the pelvis, trunk, scapula, and humerus. For the rotator cuff, the critical issue is the balance of forces centering the head of the humerus, and to a lesser degree, freedom of movement. It is more critical that the internal and external rotators are equally flexible, rather than how flexible they are. Core stability: core stability is critical it is for the inner core of the body and providing a stable strong support for the shoulder to work off. A good shoulder needs a good foundation. The core also provides the kinetic chain for overhead activities, allowing the trunk muscles to transfer energy and momentum to the shoulder for overhead sports. For the shoulder, the critical areas are the lumbar and cervical spine and the scapulothoracic joint. If these areas are not stable, significant extra loading and strain is passed on to the shoulder joint. Rotator-cuff strength and control: the rotator-cuff muscles are dependent on the good positioning of the scapula for effective control. If the scapula is angled too far forward or downward, for instance, while the tennis player reaches overhead to smash, the rotator-cuff muscles are biomechanically disadvantaged and may result in failure of the prime mover muscles to generate power. The rotator cuff should be balanced throughout the overhead movement, centering the humeral head on the glenoid. This requires equal strength and flexibility of the force couples of the rotator cuff. General muscle strength: once the essential issues of technique, flexibility, core stability, and rotator-cuff control are being implemented, we then should also look at the 'outer core'. What is the rest of your body like - does it help or hinder the performance of the shoulder? Athletes often overwork and build up their 'mirror muscles' at the front of the shoulder, such as pec major, front deltoids, trapezius and rectus abdominis ("six pack"). What is often critically overlooked, however, is the imbalance that can develop between the front of the shoulder and the back. In those athletes that are carrying an overuse injury in the shoulder, nine times out of ten they have overdeveloped pecs and lats relative to their lower trapezius, rhomboids, posterior deltoids, and posterior rotator cuff.